RV Tire Safety: Is it time to consider buying tires "Made In China?" Is it time to consider buying tires "Made In China?" My most popular post was the one back in Jan. 2012, "How-good-are-chinese-tires"
Recently I read a post that I thought some might find interesting on what some with strong sales background have to say about tires made in China, so I'm passing along this link from AutoGuide: "Should-I-buy-tires-made-in-china?" I consider this article to be a good, well-thought-out article on tires made in China. I have also noticed that while many of the low-cost tires seem to have a warranty that ends about the time you pull out of the tire store or RV dealer's parking lot, there are a few offering 3- to 5-year warranties which make them, in my opinion, worth your consideration. There are even a couple I know of that are offering 75 mph speed rated tires in ST-type sizes that appear to actually be real commercial-grade tires. Now, please remember I have not personally conducted testing on many tires made in China so can only work with some limited data, but I do believe that there are tires coming out of China with acceptable quality in them. You still need to consider general availability and what you might need to do if you actually want to make a warranty claim. If you are buying on the Internet, then obviously you will not have a "brick & mortar" location you can go to to get service. You do need to figure the cost and hassle associated with having to ship a failed tire back to some location and what you are going to do about having a replacement available. This might entail the need to have a mounted spare on hand at all times. Just something to consider. One final comment re the low cost ST-type tires from China seen on many trailers. When evaluating the tires you might see if the tires on the trailer are a brand that you can buy at retail or if they are only seen OE (original equipment) on trailers. If you can't find the tire at retail then there is a good chance it is a low cost "container baby" where the lowest cost per tire in container lots is the only performance criteria considered important by the importer or RV assembler. Subscribe to the weekly RVtravel.com newsletter or one of our other newsletters about RVing. Great information and advice. Now in our 14th year. Learn more or subscribe. Sorry to hear about your problems. I am courious, What is your "reserve Load". Tha is the excess laod capacity of your tires vs the actual load on that tire? Was the failure a Run Low Flex failure of the sidewall or was it a belt separation? Did you file a complaint with NHTSA and provide the full VIN and tire DOT serial? Did you happen to get any pictures of the failed tire? What was the reason for the TV tire failure? 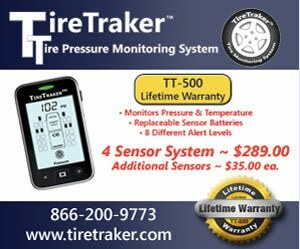 Do you run TPMS? If you send me pictures I may be able to give you an idea.